Description of "The Art of Living"
Become more and more aware of the precariousness of life.Learn how to live by being responsible.As awareness increases mind is filled with awareness and you act from awareness. When you act from awareness, the action is complete without any hangover. Then you will know what it is to be free even while acting.Action with motive is binding because it is directed, it is incomplete because you act from the ego and incomplete action leaves a residue of experience which knocks your door for resolution.God is an invention of man for his comfort, just as religion is also an invention of man. All religions keep you in ignorance because religion is created by thought. You must negate all thought created things like god, religion if you are serious to find the truth.This negation comes out of diligent understanding but negation is not intellectual.Then your mind is empty of beliefs, dogma, nationality, caste, creed, race religion etc and has the capacity to comprehend that which is ultimate truth that can never be touched by thought.Through negation of false you touch what is true, so in search for truth diligent negation is the most positive act. Belief, dogma, conformity, imitation are the most negative acts possible. Get rid of them first.You are already the truth, so you have to negate the ego smoke that is formed over the mirror of consciousness from many centuries during evolution. In psychological inquiry never depend on anybody as authority be it a savior, book, scripture, guru. Death is knocking at your door; it can happen at any time. Life is momentary, a soap bubble, just a pin prick and it is gone forever. How can you remain unaware? Bring awareness to each act. If you take life for granted and think you are going to live forever you remain unaware and vegetate. 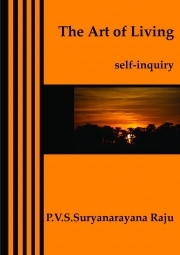 The author,Dr.P.V.S.Suryanarayana Raju is pediatrician from Andhra Pradesh,India,born on 12th December 1950.He is working on the subject of self-inquiry for the past 30 years.His works include Insights in self-inquiry,The Alpha and Omega of self-inquiry,Commentary on who am i,Know Thyself,Inner conflict leads to outer disorder,Self-inquiry is The Art of Unveiling The Self,From despair to bliss-the message of Bhagavad Gita,The essence of Bhagavad Gita,Self-inquiry in Bhagavad Gita.His books in Telugu which include "Nenevadanu? which is a commentary of him on "who am i" in Telugu,Nija Vicharana and his most recent books in Telugu Vichara Chudamani,and Vichara Chandrodayam mainly deal with the practical aspect of self-inquiry and he explains in them why self-inquiry is a direct and easy way for realizing the Self. Reviews of "The Art of Living"